Here's another nice carnival of plant blogs. The Phactor appreciates the mention and the effort to round up so many interesting postings. 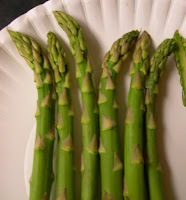 Asparagus. How easy is that? You thought botanical Latin names were so difficult, but you have been using some of them all along. Starting with asparagus seems logical alphabetically, but it's also spring, and nothing, nothing is better, and nothing, nothing says spring more than fresh asparagus. You will probably have to work on pronunciation a bit. The last syllable should probably use an oo vowel sound, so goose instead of gus. Asparagus is one of the pleasures of the northern temperate zone, but if you want a taste treat to treat, complement this vegetable with a bit of the tropics and have the best of both worlds. Here's a gastronomic suggestion. Top your lightly steamed asparagus (please do not tell the Phactor you boil it) with a generous dollop of avocado butter. Avocado butter recipe: 1/2 cup soft butter (1 stick), 1 ripe avocado diced, 2 Tbsp fresh lime juice, 2 Tbsp finely chopped parsley, 2 tsp worcestershire sauce, 1/2 tsp finely minced garlic (1 small clove), and a good dash of Tabasco sauce. Combine in a mixer, place in a covered container and cool to firm up. It will last a week or so fresh in the fridge. It can be frozen and chunks cut off for use if you give it enough time to defrost. Student involvement in local politics is great! Don’t you love it when students, especially Political Science majors, get involved in local politics? Let’s see what troubles David. The city “increased the underage drinking ticket dollar amount from $250 to $275.” Well, I can understand his concern. How do you justify a 10% increase? That does seem to be excessive, although prices are rising all over. Have you checked the price of beer lately? Oh, as a freshman, David probably isn’t old enough to be in liquor stores, so it’s hard to see how this affects him at all. David wants to “Make a change in the way students are treated” [in our city]. “We can stop the town from making more ordinances that negatively affect us.” Well, you can certainly understand that. OK, there was the increase in underage drinking ticket fine, what else? Oh, yes, the town requires purchasers of kegs of beer to register their address, and “police will now have a list of all the parties in town.” OK, I agree this is kind of big brotherish, but why am I not too worried? First, I hate to tell David this, but finding most student parties is pretty easy, which is why I question the need of this ordinance. You turn your head, listen for any blare that can be heard more than 10 or so blocks away, and there you go. Even though I will have to register whenever I buy a keg, I doubt the police will bother me because I won’t be buying 20 or 30 kegs, a sure signal to most law officers that here is party that will get out of hand. Here's a hint: know the names of everyone at your party to minimze trouble with the law. David’s conclusion is hard to argue with. Ordinances on underage drinking and regulation of keg parties, which lead to the former, certainly negatively affects students, and they don’t negatively affect the rest of us because we don’t break the law. Yes, it would be nice for David if the drinking age was 18 again, along with registration for the military draft, but all of this has been changed. Still for David, I would consider bringing it all back, although the beer in the military has always been bad. Still with the student penchant for lite beer, maybe 3.2 beer won’t seem so bad. Now I might suggest to David that how the city treats students is based upon years of experience, and since he’s new, David wouldn’t know this. For example, here's another ordinance that negatively affects students. The reason you can’t have cushy chairs or couches on your front porch or in your front lawn is because it led to the spring, end-of-semester ritual of dragging them all into the streets and setting them on fire. No question this was festive, and enjoyed by many, unless you were sleeping on the couch (yes, that happened once). Personally, this ordinance has never been a problem for me as my furniture stays in the living room where it is guarded both day and night by sleeping cats. I will suggest that if David gets his beer discretely, and has parties with only 10 or 20 of his close intimate friends, instead of 200 to 300 passers-by who pay to get in, I think he’ll find that no one cares and these ordinances won’t have a negative impact on his activities either. But if David thinks our current pretty mellow mayor, who is up for reelection, is a prig about drinking, and a thorn in the side of student fun, well, he might want to ask his opponent what his more uptight Christian attitudes are about underage drinking. Even a political science major can figure this one out. The Phactor does earn his salary, and for the sake of any Lincolnland legislators who happen to read this (if any happen to be able to read! ), its a real bargain to get such expertise so cheaply! All kinds of crazy, goofy, off-the-wall botanical questions that people come up with get directed to me. Even the Botanical Society of America sends the questions they get to me. Why? For the simple reason that having been a botanical garbage mind for several decades means they get answers. The Phactor delivers! It's a the result of a great deal of diverse experiences combined with a broad knowledge of botany. Please understand, most of my botanical colleagues are experts that can run circles around me, but only in their specific area of expertise. The Phactor is broadly knowledgeable, and also has a very good botanical memory. Telephone numbers, people's names, birthdays, anniversaries, the date, social events, these things I can't remember at all. But every place, every plant, every plant name, every bit of information, gets logged away for later recall almost effortlessly. So, how does this go? Glad you asked. This AM my friend Bill, executive director of the Botanical Society, sends me an email and a picture. Someone wants to know what this is. The picture was taken in the Bahamas. Already I know this is probably useless information. Most people visiting the tropics for vacation see very few native plants; mostly they see UTF, ubiquitous tropical flora, a set of plants that have been moved around the world by humans for some particular use, often because the plant is attractive. Well, there it is. Fortunately for my reputation, this is pretty easy. This is an immature fruit of a screwpine (not a real pine at all), Pandanus utilis, probably. The big long leaves with nasty saw-toothed margins are commonly used at a thatch roofing. And of course the Phactor was right, this is an old world plant, a native of SE Asia, so it is an exotic introduction to the Bahamas. The appearance of screw pines must attact people. They are big, somewhat ungainly, somwhat palm like plants with many stems and huge stilt roots. I say this because I was asked to ID a similar species of screwpine about a year ago from a picture taken in Thailand. And it's hard to tell you how I know what this is because there is only an instant recognition of screwpine. Now if only I could get people to pay for this service. Whether you knew it or not, the oxygen in Earth’s atmosphere, which you probably think of as a life-giving gas, is actually the toxic metabolic byproduct of the particular type of photosynthesis found only in cyanobacteria (blue-green algae) and chloroplasts, which is actually one and the same place as any loyal reader of the Phactor knows. All evidence tells us that life on Earth when Earth was young was a very different from what we think of today even if we try to avoid the bias inherent in having a big organisms perspective. Life on Earth is still mostly unicellular. All organisms were anaerobic meaning their metabolisms did not require free oxygen. Actually most “modern” metabolic machinery operates in the absence of oxygen too; what changed was the last step where oxygen became a handy place to stick a leftover hydrogen with the added benefit of changing toxic oxygen to harmless water. New evidence has been reported that pushes the “origin of photosynthesis” back by some 750 million years to about 3.46 billion years ago. Hmm, ever the prescient biologist, the Phactor has been telling students for years that oxygen-generating photosynthesis began about 3.5 billion years ago, clearly on the basis of some pretty sketchy evidence, but clearly what those fossils implied was correct. And how long did it take to convert the Earth’s atmosphere? "Once cyanobacteria appeared in one area of the ocean, it probably took less than 10 million years to fully oxygenate the atmosphere and oceans." Translation: not very long at all. Now I hate to niggle, but this is research does not provide evidence for the origin of photosynthesis, but only an earlier appearance of oxygen liberating photosynthesis. Both the green sulfur and green non-sulfur bacteria (chloroflexi bacteria) are also photosynthetic, but neither liberates oxygen. This requires a set of metabolic equipment only found in the cyanobacteria (and then, after some became intracellular slaves, in chloroplasts). Chloroflexi bacteria are arguably the most ancient lineage of living organisms, so there is good reason to think other forms of photosynthesis are older. Perhaps photosynthesis using chlorophyll was derived from bacteriochlorophyll, and some photosynthetic bacteria are capable of functioning in the “dark” by using infrared wavelengths. Still we shouldn’t take oxygen for granted; you never can tell when some bacteria may go some bacteria may go bad. The picture at this link gives new meaning to “black smoker”. The Phactor is employed at an institution that often gets overlooked, and that can be rather annoying at times. Here in Lincolnland the perception was one of being quite ordinary, even when you knew you were much better, and as good as some institutions students were clamoring to get into. How does the happen? Perceptions do not match reality. However there are times when it's good to be overlooked. Here's another college ranking that ignores our institution, and this one is gnarly to the max, but I'm not feeling badly about being overlooked. Still other college rankings make you so glad to be ignored. Other institutions find still other ways in which to excel; how easy is easy? Do you have a pulse? Of course your institution does everything it can to change its reputation, recruit better students, and generally upgrade itself academically, and then you learn that the most frequent reason students chose you university over another was the quad was so attractive. Maybe I should go plant some more trees. If there is some small hope for the future of our planet, it's to be found in kids like these. Actually I'm not worried about the planet. Earth did fine without humans for 3.8 billion years, and it will do just fine without them too. So it's really just our species that's a worry, and all of those other organisms that will become extinct because of us. But this is how revolutions start, small, locally, people doing what they can when they can. So here's my congratulations to these kids, you, and other people like you, are the best people on Earth today. What better day to celebrate the green than St. Patrick's day. And what green is more important than chlorophyll? Chlorophyll is only found in two places those being green bacteria and chloroplasts, and as it turns out those are one and the same. 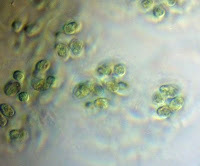 Diverse evidences indicate that chloroplasts had their origin as a cyanobacterium (blue-green algae) that became a cellular slave rather than lunch. This particular symbiosis has been rather successful, in fact that bacterium that became a chloroplast is one of the most successful organisms in all of life history. And this success has had its impact on life. The particular type of photosynthesis found only in cyanobacteria and chloroplasts liberates oxygen as a by-product because if obtains hydrogen from water. One of the more remarkable insights of biology is that all of the free oxygen in our atmosphere, the oxygen that makes aerobic respiration possible, the oxygen we think of as a life-giving gas, accumulated as a by-product of photosynthesis. And of course oxygen was toxic because life was anaerobic. That much oxygen doesn't accumulate overnight, and diverse evidence suggests that oxygen-liberating photosynthesis has been around for 3.2 to 3.5 billion years. So let's hear if for the green of chlorophyll and the most successful organism of all time, a cyanobacterial cellular symbiont! I'll drink to that. Gneater (neater) than all get out! Visits to our teaching greenhouse still manage to deliver surprises even thought I have been doing it regularly for years. This is something the Phactor had never seen before: the ovulate strobilus (cone) of Gnetum (knee-tum). Hmm, that's pretty funny, telling you how to pronouce a silent G with a silent K.
Gnetum is a tropical liana, and that's one of the reasons I've never seen strobili before. They're usually way, up, there. The closest I've come before is the seeds, mature ovules, which are about 4 cm long. They have a fleshy, reddish outer seed coat that attract and reward an animal disperser. Finding these seeds on the rain forest floor means that somewhere far above where the vine clamors along in the canopy, a strobilus just like the one above got pollinated. The strobilus consists of several whorls of small bracts (modified leaves) above which is a whorl of ovules. Ovules are not eggs so their name is a misnomer. Ovules are jacketed, indehiscent megasporangia. The single megaspore produced develops into a haploid female (a gametophyte) who then produces an egg. The jacket prevents the pollen access except through a small hole. The ovules shown here are ready to receive pollen. The ovule has exuded a a drop of sticky liquid out through this small opening and any pollen grains (endosporic males) that adher to the surface of this pollen drop get pulled inside the ovule when the ovule reabsorbs the liquid. This is not the work of a passive female. She reaches out, grabs passing males, and pulls them into her lair. Now if the foregoing description wasn't a tipoff, what makes Gnetum so Gneat is that this is a gymnosperm, a relative of conifers, albeit a fairly distant one. Yet as you can see, this vine has broad leaves, and it has vessel elements in its wood, both features usually associated with flowering plants. And of course there is a certain flower like quality to the strobilus. Do flowering plants share a common ancestry with Gnetum? The jury is still out. For many years data suggested that the answer might be yes, but most recent studies suggest this strange plant is more closely related to conifers, and not in a gymnosperm lineage having a common ancestry with flowering plants. There are so many things wrong with these rather smug arguments about the moral evil of stem cell research that you hardly know where to begin. But let’s just take one issue. The ban on stem cell research was based upon religious ideology that the Bush administration agreed with. Their position was simple: from the moment of conception a zygote is fully human and deserving of protection. The Catholic Church latched onto conception when it was first clearly understood what was taking place because it seemed to provide a definitive point to say here’s when human life begins, here’s when you acquire a soul. Historically and religiously the point at which life begins has changed. Actually this isn’t about life per se, but about when you are an individual person. Of course, few argued with the idea that you become a person at birth. Although in earlier times when infant mortality was high personhood was acquired post-birth, at christening, which is now done at birth officially. While a zygote may be genetically an individual, it is not a person. A zygote contains a set of instructions that can lead to a person after a considerable input of materials and labor (sort of a pun). The difference is simple. A fried whole chicken dinner is not the same as a fried egg. A set of blueprints is not a house. If you bought one you would be indignant about receiving the other. Not to mention the fact that in one out of every 800 or so human conceptions something interesting can happen up until the 12th day of development. The zygote or embryo can split and produce identical twins. Do they share a soul? They both have the same chromosomes which is where the soul must reside as there is nothing else in a zygote. Are twins hemi-souls, or half soulless, something less than fully human? Ridiculous. This shows the folly of insisting that personhood extends back to conception because twins became individuals after conception. After all you cannot murder a twin and then declare the act inconsequential because that genetic individual still exists. And many people now think that personhood is acquired when human specific brain activity begins around the end of the 2nd trimester. Interestingly enough most people agree that when such brain activity ceases a body is brain dead and the person is gone even if the body remains alive. But many fewer agree to apply the same standard for the beginning of life. But it is a scientifically defensible position. Now the point here is not to say that one perspective or the other is correct, but moral people of good conscience can disagree about this issue. Science does not provide a definitive answer, although changes in medical practice and biological knowledge can shift these concepts unless your position is dogmatic. So in a nation that has a diversity of religious traditions, and a diversity of ideas about personhood even within some of these religions, by what right does one religious tradition, one religious belief, think it can force its ideas upon everyone using the weight of government? The ban on stem cell research forced everyone to accept the validity of one particular religious perspective. But that is the way it is today. For some people religious freedom means having it their way because they have no regard for anyone else’s freedom. Simple label other ideas immoral and you can trample their liberties with a clear conscience. Sorry, but people who place their religion over everyone’s liberties strikes me as un-American. You may not be the Taliban, but it is only a matter of degree. To end on a lighter note, the Phactor was once asked in a telephone survey about my position on using stem cells for research. I said, no problem. Those parenchyma cells are totipotential; they can dedifferentiate and their development altered to create a whole new plant. Say hello in the Pleistocene. A linguistic analysis of languages argues that similarities identify old words, essentially demonstrating a shared ancestry. According to this analysis the oldest words are: I, Who, We, Thou, Two, Three and Five. Go back 10,000 years and say, “Who we two?” And you stand a good chance of making yourself understood, if that sentence actually makes any sense. I mean, surely the speaker knows who one of the two people are, themselves. Clearly this isn’t much of a vocabulary to work with. But the idea is that certain sounds associated with certain ideas haven’t changed too much and are quite similar across languages. The authors say these words are resistant to change (OK the article uses the term evolution, but they mean just change). Words that are changing rapidly are more likely to disappear, e.g., dirty, squeeze, bad, because, guts, push (verb), smell (verb), stab, stick (noun), turn (verb), wipe. Apparently the more colorful the word, the better it sounds, the more subject to change. Hmm, there isn’t much here to make me shed a tear if the word disappeared because we could still say: soiled, crush, ill (naughty? ), as, entrails (fortitude? ), detect by olfaction (who nose? ), stick (oops! ), limb, flip/veer, handkerchief. Sounds like the Phactor could use some help with more suggestions of single word replacements for these soon to vanish bits of language. A word I wonder about is beer. That seems pretty consistent across several languages. And it’s far more useful than “squeeze”. So you find the local Pleistocene saloon and say, “Two thou beer.” Now we be getting somewhere. Hotter summers, more draught, rising sea levels, melting ice caps, doomed polar bears. Yawn. If none of that rouses your interest and ire, how about this? One of the first crops that may be seriously affected by global warming is cacao. Yes folks, global warming is going to take away your chocolate! What is there to live for? Cacao grows in the rain forest understory, and its growth is very sensitive to droughts, not to mention disease and insects. One thing that is becoming abundantly clear is that shifts in weather patterns and increased tree mortality may send rainforest into refugia just as it did during glacially induced droughts of the Pleistocene. Now this does not mean chocolate will disappear, but it will become the caviar of confections, too expensive for those of us living on academic salaries, too expensive to remain that simplest of pleasures, too expensive to be squandered on kids. Once again chocolate will approach the status of chocolatl, the Aztec royal beverage, and be served in gold vessels. Do you want this to happen? Well, let's all get busy reducing our carbon foot prints and showering our political duds with milk duds to remind them what is at stake! If you check out the article, how about helping the Phactor improve his word power. What the heck does "gouchest" mean? My giant old Funk and Wagnalls only offers the suggestion that in Scotland "gouch" refers to an offensive odor. So what is the "gouchest threat"? Something certainly stinks here. How ironic that I had mole for lunch. FYI the image is a display window for Sprungli, the giant chocolate confectioner in Zurich, Switzerland. See the bunny in the red track suit? Regular visits to our teaching greenhouse are part of my job and mental health program. Although the facility is not physically impressive, the number and variety of plants contained therein is quite impressive. Interesting observations of exotic plants happen regularly. Over 20 years ago I brought a small tropical tree seedling back from Queensland Australia. It’s the genus Maniltoa in the legume (bean) family and it now has nearly outgrown the greenhouse. If it were not pushing up against the greenhouse glass this tree’s limbs and leaves would show a graceful arching. But this plant has a most unusual and ornamental feature. 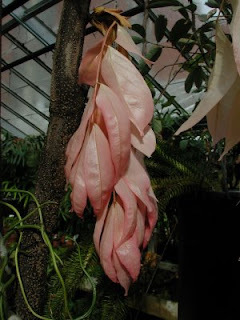 It produces huge buds from which emerge whole branches bearing nearly full-sized leaves, but here’s the strange part, these branches and their leaves are pink and totally limp. They dangle down like rags, and since the tree tends to flush, a number of such pink branches emerge from buds all at once. Such flushes of new vegetation are thought to overwhelm herbivores that might attack the new foliage. 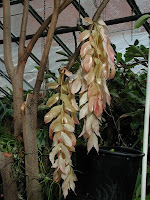 Slowly, over a couple of weeks, the pink pigments fade and chlorophyll slowly develops turning the leaves pale green. And then, over another few weeks, the branches and leaves slowly pull themselves up into a rather graceful arch. They accomplish this by having a specialized swollen zone called a pulvinus at the base of leaflets, leaves, and branches. Looking and acting a bit like a knuckle, the pulvinus (see close up on right) reorients the branches and leaves. The same structures close up and droop many legume leaves at night and account for the movement of leaves on the touch sensitive Mimosa pucida, another legume. So our Maniltoa has provided us with a bit of colorful tropical cheer on a cold, late winter day. Enjoy.